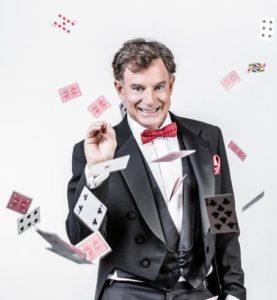 The Associates present a very special fundraiser, an evening with Magician Dean Apple. Hailed as “Palm Springs Premier International Man of Magic,” Dean Apple is equally comfortable performing close-up magic for an intimate gathering or on stage for performing comedy magic for 1000. Featuring his awarding winning illusion “The Time Machine,” which is currently in auditions for America’s Got Talent, he also has an award-winning assistant in his wife, Debbie Apple, aka Pinky. He has performed at celebrity events featuring stars as diverse as Magic Johnson, Jay Leno, Congressman Raul Ruiz, and RG III and has appeared on TV’s Criminal Minds, Turning Point, and CBS News. Dean started performing magic at the age of seven, for family and neighborhood kids. His passion today remains the same: to entertain audiences, altering reality one trick at a time, by making each moment magical! He resides in La Quinta, CA with his wife Debbie, their yellow lab Bailey, and of course, Tickles the bunny. The Associates of IAF/Magic, PO Box 303, Idyllwild, CA 92549. Please indicate names of all guests. Become a sponsor of this exciting event. See our sponsorship levels below. Contact Associates@Idyllwildarts.org or mail check to the Associates, PO Box 303, Idyllwild, CA 92549 – Marked Sponsorship. $500 Abracadabra Level: 8 reserved seats at front of house, recognition in event’s program, recognition from stage, personal introduction to Dean Apple. $250 Hocus Pocus Level: 6 reserved seats at front of house, recognition in event’s program, personal introduction to Dean Apple. $100 Voila Level: 2 reserved seats at front of house, recognition in event’s program. Proceeds from this event, as with all Associate produced events, support the Scholarship Fund of Idyllwild Arts Academy and Summer Program.